Before FBI Director James Comey was fired on Tuesday, there weren’t many politicians on either side of the aisle who were pleased with him or would have been sorry to see him go. Hillary Clinton recently blamed him for her defeat in last year’s presidential election by having re-opened the investigation into her mishandling of classified material less than two weeks before the election. 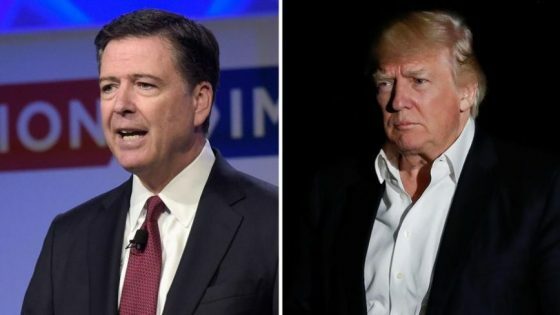 Comey had confirmed in March that the FBI was investigating connections between advisors to President Donald Trump and representatives of the Russian government, both prior to the election last year and in the period between the election and the inauguration in January. But as soon as the bombshell announcement was made late Tuesday afternoon, the Democrats and their allies in the media had found their latest “Watergate” scandal. Trump’s firing of Comey was compared to Watergate’s “Saturday Night Massacre.” Trump was said to be Nixonian because, they argue, he is attempting to shut down Comey’s investigation into his supposed collusion with the Russians. Rod Rosenstein, the Deputy Attorney General who was confirmed by a 96 to 4 vote in the Senate on April 25, wrote the letter recommending that Comey should be fired: “The Director was wrong to usurp the Attorney General’s authority on July 5, 2016, and announce his conclusion that the case should be closed without prosecution. It is not the function of the Director to make such an announcement,” wrote Rosenstein. CNN’s Erin Burnett was obviously confused when discussing Rosenstein’s rationale. She said, laughingly and in disbelief, that candidate Trump had “praised Comey for that decision.” But what Trump actually said about it on July 5, shortly after Comey’s announcement, was that “Today is the best evidence ever that we’ve seen that our system is absolutely, totally rigged. It’s rigged.” Clearly Burnett was thinking about Trump’s praise for Comey after he re-opened the investigation into Hillary’s emails just 11 days before the election. The fix was clearly in for the investigation into Hillary’s email scandal, which was a genuine national security scandal. Following the revelation that then-Attorney General Loretta Lynch had met with Bill Clinton in a plane at the Phoenix airport, she refused to recuse herself from the case, instead saying that she would follow the recommendation of Comey. Comey then interviewed Hillary for about three hours, and just a few days later, without comparing her answers to previous statements she had made on the record, such as during her testimony before the House Select Committee on Benghazi, he let her off the hook. Comey laid out the case for Hillary’s indictment, but concluded that no reasonable prosecutor would prosecute the case. Calls for an independent counsel or commission to investigate Trump’s ties to Russia are a misguided distraction from two much more relevant investigations: President Barack Obama’s attempts to undermine the Trump candidacy—and now the Trump presidency—as well as actual, well-documented financial and business ties between the Russians and the Clintons, including Hillary’s campaign manager John Podesta. A recent, lengthy feature by The New York Times attempts a postmortem on the U.S. 2016 presidential election. The Times’ editorializing about the election is based on innuendo and false reporting. The Times reporters write that the alleged Russian influence on the election, tilting it in favor of Donald Trump, was a bigger story than Hillary Clinton’s email scandal. This might be, at best, considered a matter of opinion. But at worst it is a gross misrepresentation of the facts. In other words, it is impossible to parse the effect that Russian activities had on votes, but possible to verify that the Russians did not alter the vote tallies. After nearly a year investigating supposed Russian collusion with Trump to help him win the election, there is no supporting evidence. Clapper confirmed again this week that he has seen “no evidence” of collusion between Trump associates and Russian officials or foreign nationals. This is blatantly false. Mrs. Clinton could have been pursued under charges of gross negligence. As former federal prosecutor Andy McCarthy notes, “‘malicious intent’ is not required to prove felonious mishandling of classified information.” Comey did say that Clinton was extremely careless. But the Democrats and the media think they finally have their weapon to defeat Trump. Meanwhile, though the Republicans still control all Senate and House committees, they still lack the will, or the vision, to set the agenda and shape the narrative.